Colonel Reed: What’s the best way to go about disarming one of these things? Staff Sergeant William James: The way you don’t die. It is no secret that Iraq war movies are a hard sell to both audiences and critics these days. Audiences seem to want nothing to do with watching the hardships of their fellow countrymen on screen and critics can’t seem to agree on any one picture that gets it right … until now, that is. Kathryn Bigelow’s THE HURT LOCKER still has to prove itself at the box office but has almost universally wowed the critics, including this one. It has done so by stripping itself of any pretense or need to speak out against the war. No, Bigelow’s take is not one of condemnation but one that is simply humane and frank about reality. THE HURT LOCKER may just usher in a new breed of post-war films, despite the war not actually being finished. Perhaps this is why the film works – because it isn’t about the war itself but rather the effort to clean up the mess that was made. 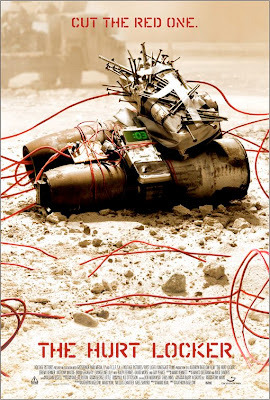 The title, THE HURT LOCKER, refers to a place of pain that you cannot get out of. In this case, the hurt locker is Baghdad but there is hope. 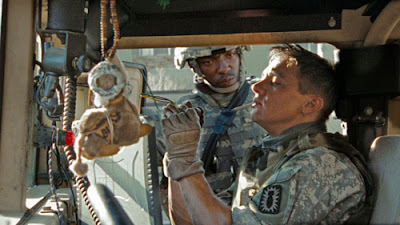 For Staff Sergeant William James (Jeremy Remmer) and his crewmen, JT Sandborn and Owen Eldridge (Anthony Mackie and Brian Geraghty), their particular hurt locker has an expiry date on it when we meet them. These three men, all admirable and all seemingly stable, form a team called the Explosive Ordnance Disposal (EOD). This is a fancy way of saying bomb squad and together, they have about three weeks or so left in their tour. Bigelow shot over 200 hours of footage, using sometimes four cameras at a time when shooting, to capture an authentic documentary style. The cutting is sometimes so quick that we go from patrolling the perimeter to guarding the rooftops to being right at the side of the bomb. 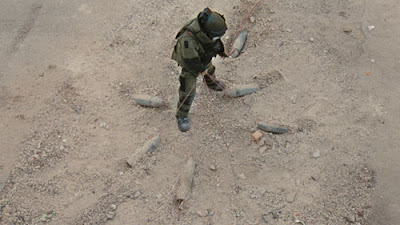 Subsequently, we are the fourth members of this EOD and this becomes our hurt locker as well. Bigelow (perhaps most famous for directing Patrick Swayze and Keanu Reeves in POINT BREAK, way back when the first gulf war was coming to a close) brings a feminine sensibility to THE HURT LOCKER that removes the obnoxious male ego we are so accustomed to in war films. Sure, team leader, James does things his way and that gets him into trouble from time to time but he doesn’t do it to get in anyone’s face and he doesn’t do it to prove he is a big man. He does it, from what I gathered because Bigelow is subtle enough to let us do the thinking ourselves, because he is good at it. For James, this is not a hurt locker; this is home, where he knows that who he is and what he is good at is being put to its best use. Remmer (most recently seen in TV’s now cancelled “The Unusuals”) is a great leader for both the team and the film; his presence and dedication command respect from them and admiration from us. Of course, dismantling bombs is no Iraqi picnic. 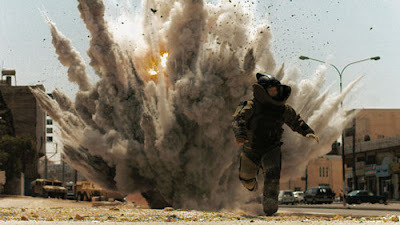 The true genius of THE HURT LOCKER stems from Bigelow’s handling of Mark Boal’s delicate script. (Boal spent time with an EOD squad to write the script.) Like the men on screen, Bigelow has no interest in the superfluous. She has a job to do and if she doesn’t do it right, it will blow up in her face and take down anyone in the immediate radius. Despite this, she gets right up in the face of the bomb without fear at all times and somehow manages to make an explosive film about making sure explosions don’t happen.